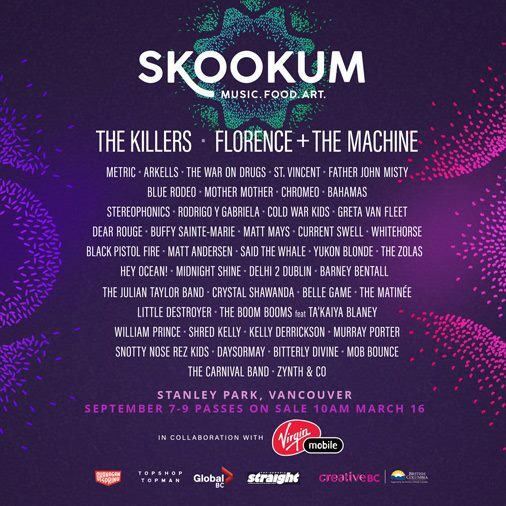 The SKOOKUM Festival is coming up September 7-9, 2018 in Stanley Park and with acts like Arkells, Metric, The Killers, Florence + The Machine taking to the stage, local culinary rockstars will be serving up delicious meals at pop-up restaurants, long tables, and more. SKOOKUM will be unlike any other music festival, offering gourmet culinary experiences and tasting areas that will showcase some of the best BC wines, locally-produced craft beers and a selection of local craft distilleries. Tickets for the following new add-ons will go on sale Friday, June 15, 2018 at 10:00am on the SKOOKUM Festival website. SKOOKUM Long Table Dinner Series includes some of BC’s best restaurants and chefs including Edible Canada with Ocean Wise ambassador Ned Bell, Joy Road Catering from the Okanagan Valley, and St. Lawrence + Kissa Tanto collaborating for a dinner you won’t forget. 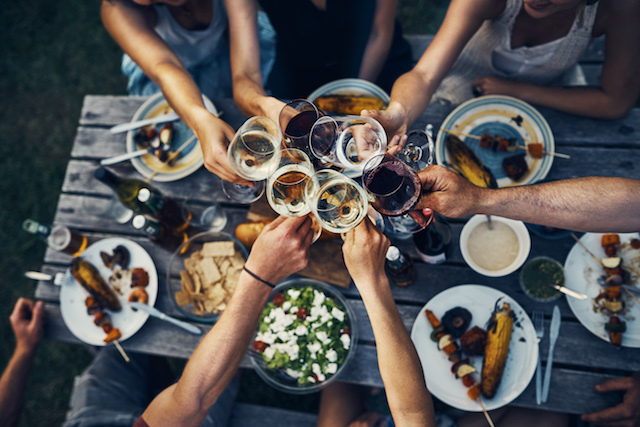 SKOOKUM Picnic Baskets will offer a variety of lunch options created by renowned Vancouver restaurants and hot spots including Hawksworth, Bel Cafe, Honey Salt and les amis du FROMAGE. Enjoy food at a music festival like never before! The value of this package is over $1200! I will draw one lucky winner (must be 19+) on Thursday, June 28, 2018 at 12:00pm. Please enjoy responsibly. Update The winner is Amanda Beaton! @rachetgrrl on Instagram and Twitter!! This is a crazy awesome prize!! Shared as well! This would be amazing prize to win. What a great line up of bands and the dinner would be a blast. Thanks for the opportunity to celebrate a last hurrah before summer ends! Wow, what an awesome prize!! So much culture and food and music!! Thanks for the opportunity! This is an amazing prize and an awesome way for me to treat my best friend! Plus a great mommy weekend! This would be OOOOOOOOOOOHHHHHHHHHH SOOOOOOOOOO GOOOOOOOOOOD!!!!!!!!! I would love to win. What a great #datenight prize!! This would be an awesome prize to win! Thanks for the opportunity! This sounds like a really fun event! And the Long Table dinner sounds fabulous and so delicious!!! Would love this! Done the above! Awesome contest! Liked and shared! Oh Yes Please! I would love to treat my hard working daughter to an amazing weekend of music, wine and food. You are the best! What an incredible opportunity on top of seeing these amazing bands in one place!! Entered with all of the above! Liked, commented, shared, followed & tweeted. OMG I am dying to try this! It almost feels like the lineup of Skookum has been custom taillored to me. Amazing festival or artists, and the foodie in me wants this long table dinner so badly! Would love to win this. This will be my dream goodbye for the winter to Vancouver!! This amazing gift would be the cherry on our anniversary weekend and my husbands birthday celebration at Skookum!! Couple of East coasters looking to make the trek across the second biggest land mass to experience the glory that will be SKOOKUM. Come onnnnn universe, from PEI to Vancouver ! Help us VIBE with you !! Omg this would be so amazing! What an amazing prize, it will be such a fun experience!!! Like and shared and commented, etc, etc. So excited for this! now this would be skookum! Two of my all time favourite things, food and music festivals! Would absolutely love this! I tweeted about this fabulous #SkukumFestival! Amazing that we have this in our own backyards. Hard to believe. I have liked/shared and commented about #Skookum Festival in the Worlds #City Park! This would be so incredible! I followed Skookum and miss 604 on Instagram as Serendip13 🙂 This would be the most amazing concert to look forward to. Amazing prize! Would love a chance to go to this festival! Following SKOOKUM and miss604 on instagram too! This looks great, I’d love to go! I’d absolutely love to win this!! Pick me! What a great prize pack! This concert looks awesome. I would love to go! Awesome! This would be the best end to the summer to win this! CAN’T WAIT TO CELEBRATE THE SUMMER AT THIS FESTIVAL!!! I love food! Pick me! Dying to go to this Epic Event!!!! Skookum Artists Line Up is Stellar & the food sounds sinfully delicious, what an Skookum Prize! What an amazing event to be happening in our beautiful backyard!!! Tweeted. Liked. Followed on Instagram! What a fantastic prize! I would love to win this. What a great lineup! Would love this!! This is going to be one of the best events in Vancouver all year! Wow! This a great event to promote! That’s look like an unique experience. I like those lineup FOOD. What an amazing event and prize pack! Good luck to all! Would love to win! Tweeted with @drama_otaku too! Sounds like a great event. Thanks for letting us know. So excited about Skookum and this would be the icing on the cake! Amazing prize pack! Yours is better than the Peak’s contest I tried to win – crossing fingers! Just did all of the above! I’d love to go to SKOOKUM to see Florence + the Machine and The Killers! Wow! This is a great prize. If I win I hope there are vegan options. The food (and line up 😉 look amazing!! Wow! Such a great prize!! Would love to see Florence! Outstanding. I would love to go! I would absolutely love to attend this festival. Thanks! This is an awesome prize that would definitely round out the festival experience! Thanks for the opportunity! Would be a great end to the summer! Liked and shared! What a fun event to attend! Then long table dinner sounds incredible! This would be Amazing! I’d love to go! Awesome bands and delicious food! I love Florence and food and would be ecstatic to win! Prize package to die for! This is the best prize- amazing! Phenomenal lineup! Almost all of these artists are regulars on my music queue. And the food would be beyond amazing. My daughter and I love to go to music festivals together! Would love to take her to the long table dinner and to hear Metric and the Killers. this looks like the event of the summer! thanks for the opportunity! Great prize pack. Would be great to win!!! Great prize pack. Would ve great to win!!! This looks like a fantastic festival that I’ve never been to. Followed on instagram. Great concept for a festival. This event will be huge, would so love to go and also partake in these luxury add-ons. Miss604, I’ll do you proud! Finally a concert series right in the heart of the city, I’d love to do this with all the food opps too! Would love to win this prize, the festival is going to be amazing. Love the whole line up for this fest, only fest I know I’d enjoy every day of! I’d love to go to a longtable dinner at Skookum festival! Would so love to go, this sounds amazing! So fun! Would love to win. Wow, would be amazing to do! And I liked on FB! What a prize!!!! Pick me p’ease! It would be so freaking sweet to get to go to SKOOKUM!!!! This would be such a fun time! Vancouver has the best events, all year round. Love living here! What a great artist lineup! wow! We are so lucky to have this amazing festival in our city. Thank you for the chance. I would love to surprise my daughter! Time off work, hotel booked, just waiting for the Festival Gods (or you😉) to shine down on me and send me some tickets. I had a horse named Skookum when I was a kid. Coincidence? Or foreshadowing that I was going to win tix to a festival of the same name a couple of decades later? I think the answer is obvious. 😉 (hint hint, nudge nudge). Great line up. I’d love to go!! This whole festival sounds amazing and I know Joy Road is an absolutely amazing caterer! I’d love to win this and support local! THANK YOU MISS 604 FOR THIS SUPER SKOOKUM CONTEST! MY PARTNER AND I WOULD BE THRILLED IF WE WON THE DRAW. THE LINEUP INCLUDES MANY OF OUR FAVORITE BANDS. Def would love this prize!! I’ve never been to a music festival before, so this prize would be awesome. I would take my best friend whom I haven’t seen in months. <3 Congrats to the lucky winner! Would love a weekend of great music, delicious food, and kid-free fun! I’m so happy Vancouver has something like this! I would LOVE to go!! Sounds delicious! Thanks for the giveaway! I’d LOVE to win!!!! This would make my summer! Fantastic Event! It would be amazing to win! Thank you for this opportunity to win tickets. It looks so Fantastic! I really want to go! Thanks for the chance to win! This sounds like an amazing festival. Summertime fun – great music and yummy food ! I would love to attend with my boyfriend. We’re both huge fans of Mother Mother, Metric, Florence, and other bands playing at the festival! I would love to win this, what a coveted prize! I would love to win this, what a coveted prize!! What an awesome prize! hope I win!! Wow! What a fantastic event this would be to take in. Food and music, what could be better! I would LOVE to win this! I missed out on buying tickets and am dying to go. What a incredible deal. ! Oh I’d love to hit up Skookum fest! And food! What a great prize. Would love to go.